Found exclusively in human-modified habitat, especially urban and public gardens in litter and under rocks and rotting logs; also in damp places in well-treed gardens. Introduced into Australia where it was well established in Sydney by 1874. Native of closed forests in Vietnam. When attacked these worms produce copious amounts of mucus. If eaten by cats may cause vomiting. Predator of earthworms. 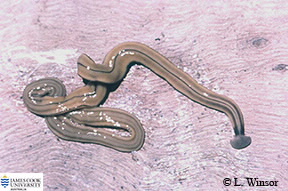 Length around 10-20 cm. Thin, brown with five dark upper body stripes that stop at a dark neck collar, belly pale ochre to cream, and rounded, shovel-shaped head.